West Coast Life Events serves as in-house reservation and coordinating office for various tourism companies in Langebaan. West Coast Life originates in 2002, went to Indaba for a few consecutive years marketing our 4-star guesthouses, and since 2009 coordinates Conferences and Weddings. With our information office currently hosted in the majestic building of Crystal Lagoon Lodge, we can easily celebrate niche events and experiences launched from Crystal Lagoon Lodge. As our network with local people is extensive, we select experiences and assist with group itineraries to ensure daily activity options that will enrich guest experiences. With our CEO a trained tour guide, West Coast Life is an informed gateway to discover life in the Peninsula of Cape West Coast. With all the infrastructure in Langebaan, it just make sense to recommend Langebaan Lagoon, South Africa’s only sea lagoon, as your springboard to the West Coast! 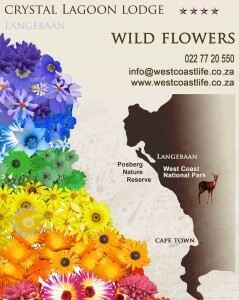 After fourteen years in the tourism trade we’ve put our wealth of local information onto www.westcoastlife.co.za. We update it from time to time with valuable features to provide visitors and tour operators with original researched content.